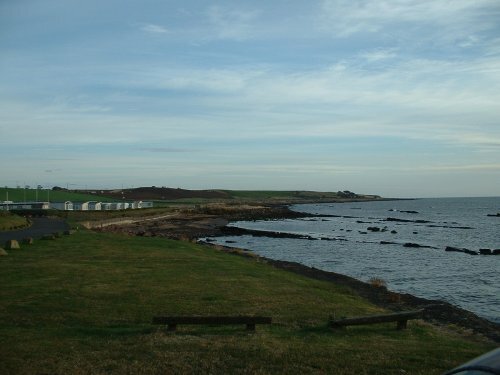 Follow instructions for Cellardyke,and Cellardyke Harbour,but carry on past the harbour until you come to a caravan site.On the sea side of this site is a public car park.This is as far as you can drive along. 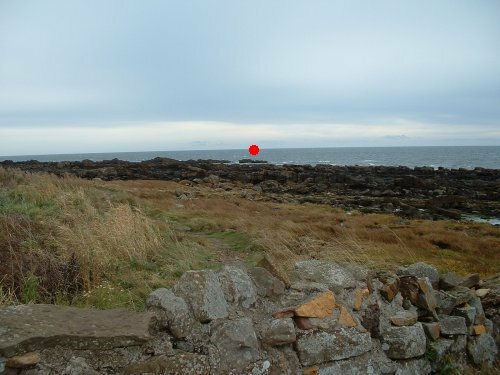 When you park up,you have to head along this coastal path towards Crail.The actual mark is just beyond the point of land in this photo.Walking along this path takes around 30 minutes to the Scoot Skelly,so be prepared. As you go along,you will pass fields of pigs,and then go through two wooden gates just as you come to the farm steadings.This is a public path and the gates are 'styles' so it's all okay.Around 100 yards past the steadings there is a stone wall with built in steps.You will now see the mark.This next photo shows the mark in relation to this stone wall. At this stage you have around 300 yards still to walk.Proceed along the path,and the mark will become more obvious.The Scoot Skelly is a large rock at the end of a long high reef of rocks.You cannot actually get onto the Scoot Skelly,but you should be fishing on the very end of the long reef,literally feet from it. 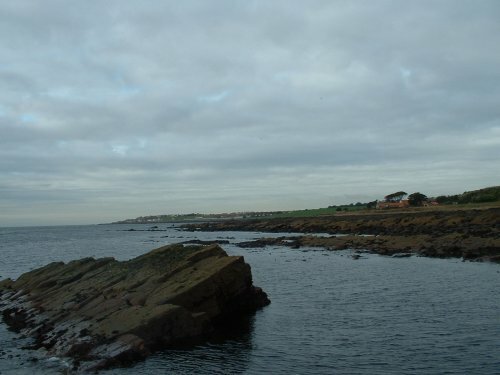 The shape of the reefs here mean that you have to walk slightly past the mark on the shore path to get to the place where you can cross the rocks to get onto the long reef that leads to the mark.Depending on the height of the tide,(from neap to spring),the mark is accessible for roughly 3 to 5 hours. congratulations,you are now ready to fish.Looking seaward from this spot there is another skelly parallel to it,and anywhere in this long stretch of water is liable to hold decent cod and wrasse.Main bait here is certainly worms or crab for summer fishing,and worms and squid in the winter. 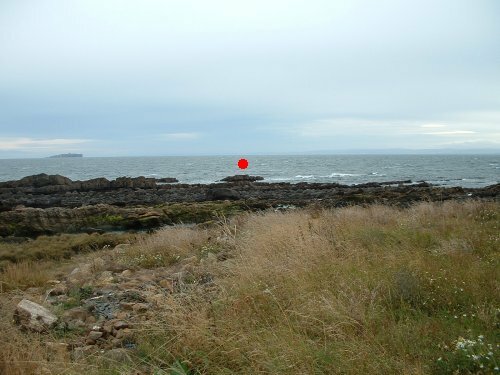 I would not recommend this mark in either rough weather or darkness,and a reasonable fitness level would be required for the walk and to get over the rocky shore to the reef. There are farm tracks that lead down to the coastal path from the main coastal road,but there are no parking places and don't be surprised if your car is fork lifed off the track if the farmer needs access.You could try asking at the relevant farms,or at the farm steadings for permission to park,and good luck if you do,but me,I enjoy the walk.